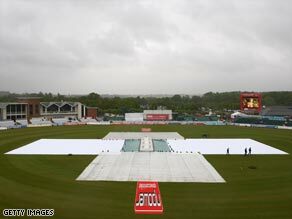 (CNN) -- Rain washed out day two of the second Test between England and West Indies at Riverside, Durham on Friday. Bad weather washed out the whole of the second day at Durham with England in control on 302-2. Alastair Cook must therefore wait until Saturday at the earliest to try to reach a new career-best score, after forecast bad weather swept across the north-east of England. The inevitable abandonment was confirmed shortly after 4pm local time, with no sign of an improvement in conditions. Cook had closed on Thursday night on 126 not out in England's total 302 for two, after he and his Essex team-mate Ravi Bopara (108) shared a second-wicket stand of 213. The highest of Cook's nine Test hundreds so far is his unbeaten 139 against the same opponents in Barbados two months ago. The washout is much more in England's favor than the West Indies', with the tourists needing to somehow win this match to salvage a series draw and retain the Wisden Trophy. However, that will be no easy task, chasing the game from an unpromising position with just three days remaining.